I’ll bet your dad loved it. Oh that is really cute!!! I love your quilt. My husband loves old tractors and has quite a collection that he has restored or in the process of restoring. I bought Lori’s book just for the tractor pattern. You did a great job and I love how you separated each row with the “crop”. 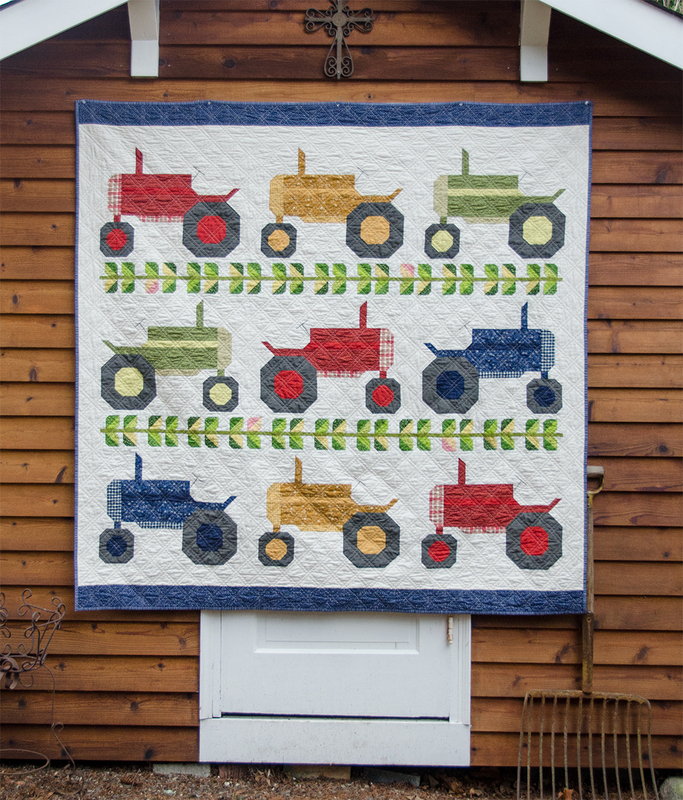 Love the Tractor Quilt and how you used colors that fit in with the tractor. My husband loves old tractors too , we have 11 (all Ford) he worked for Ford Tractor 22yrs. That was his best years with Ford, he retired after 4l yrs with Ford twenty yrs ago. We listened to President Trump’s speech yesterday in Nashville. He talked about the farmers and all they do and how they are so important to our country. So my husband sent an email out saying he need to buy another tractor to add to his collection. Not going to happen I said. He is always looking for an excuse. We always talk about how important the farmers are to us. Really appreciate all that your Dad and family do. It is hard work but like you said he loves driving the tractor. Thank you so much for sharing your story and your quilt you made for your dad. It is beautiful and know it made your dad very happy that you made it for him. Great quilt and I am sure your dad was very happy with it. I’m thinking about making one for a friend who goes to the Steam Up in Brooks Oregon every year. He loves all the old farm machines. I love it! And I’ll bet your Dad did too! 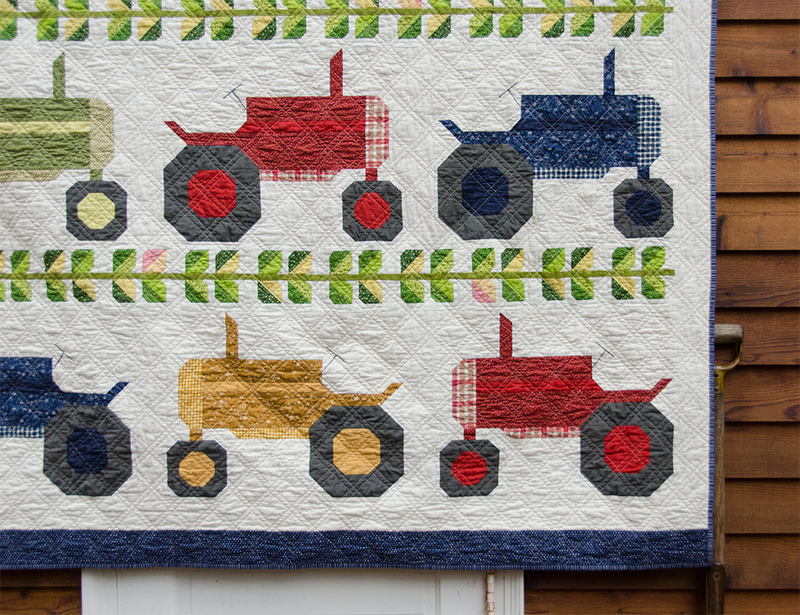 So fun to read about your dad and his love of farming, and especially tractors :o) I bet you were so thrilled to make this quilt and get it sent to him. Here where I live apples and peaches are the big crops, both commercially and for the smaller farms. I alway marvel at the faith farmers really must have. It feels like every year we are on the edge of our seats in the spring over warm weather that arrives too early causing the trees to bud out, or late frosts that threaten the buds. I think it must be so stressful for our farmers knowing they have no control over things like this. Thanks for sharing your story! This quilt is sew cute! OMG I LOVE THIS!!!!! You always make the best quilts. The tractor is my favorite block from Lori Holt’s book. I love this quilt! I may just have to make a tractor quilt now. What a great tribute to your Dad! 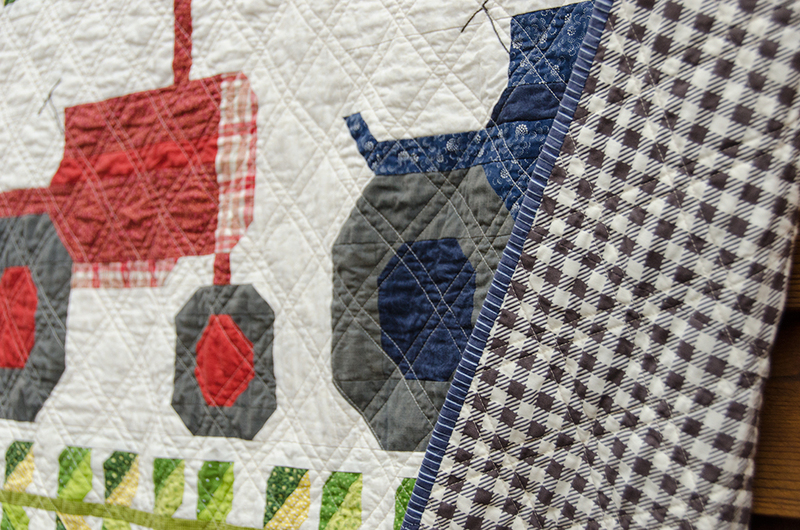 Those tractors are so charming and your fabric stash seems to be a great fit for this one. The green leaves are a bright touch. Really fun quilt, AND it brings sweet memories. I’m sure he will cherish it, especially because it was so lovingly made by you. I just love your tractor quilt. I grew up on my grandfather’s peach farm and was surrounded by old tractors. I love Lori’s Farm Girl Vintage book and have made 2 tractor pillow shams using the tractor block pattern. I think I may have to make a tractor quilt, too, now that I’ve seen your beautiful quilt. You are currently reading My dad loves tractors at Bloomin' Workshop.